This week’s ChartCraft’s survey of stock newsletter writers delivered only 29.7% bulls - up slightly from last week. And almost unchanged from last week, 44% bears. Market Vane dropped again to the low 30’s - a level last seen in October to November 2008 when the market made a short term spike down. That’s relatively low but not on an absolute level since it fell to sub-20 readings in the last bear market bottom between 2002-2003. To read more about Market Vane and its origins, check out A Brief History of Contrarian Analysis. But the most fascinating and historic reading comes to us from the AAII weekly survey. The latest American Association of Individual Investors (AAII) data shows what can only be describe as total and utter capitulation. As of Wednesday (March 4th, 2009) 70% expected the market to continue to fall, while only 19% continue to see better times ahead. 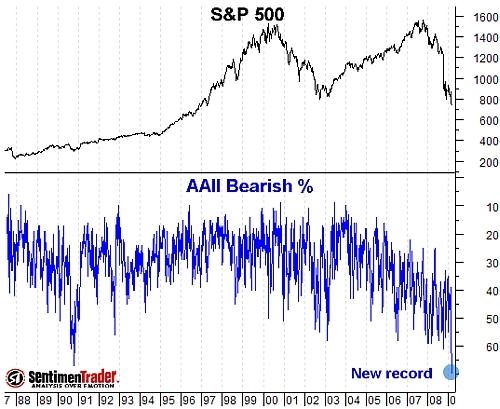 The only data point from the AAII survey that approaches this level of gloom is back in October 19th, 1990 when a paltry 13% of respondents were bullish and 67% were bearish. In contrast, the ISE put call ratio (also known as the ISE Sentiment index) continues to tread water, seemingly oblivious to any risk. The only data that can be interpreted as slightly bullish is that for the second time this year, it fell below parity - barely. On Wednesday March 4th, 2009 the ISE Sentiment fell to 95. The only other time it fell below 100 was back in February 3rd 2009 when it hit 97. Since January 1st 2008, it has only fallen below the parity level ten times. Similar to the ISE data, the CBOE put call ratio shows no sign of flight to safety. On March 5th it reached 0.90 - a relative high but by no means a level which shows a serious sense of risk. Once again corporate insiders stepped up to the plate to buy their companies’ shares. Although there is a noticeable spike in purchases (relative to sales), I wonder if it means anything because it is another in a series of similar spikes that we’ve seen going back to November, July and March 2008. This indicator has fallen off everyone’s radar - and for good reason. Right now the TED spread is still high at around 1.0 but it is far from the peak of 5.0 reached at the zenith of last year’s credit crisis. Still, relative to its own long term average it is still very high since it averaged around 0.4 for the past few years. The bad news is that at the start of the week, the Hulbert Stock Newsletter Sentiment Index (HSNSI) is at -20%. Meaning that on average, the newsletters that time the market are advising clients to short the market with 20% of their portfolio. Although this is a low number, HSNSI was more than twice as low last July. So while the market has continued to fall, stock timing newsletters are half as pessimistic. Compared this to the previous significant market bottom in March 2003. On March 10th, the HSNSI was -19.2%, almost equal to where it stands now. But back in July and October 2002, the HSNSI was -15% and +20% respectively. So clearly, we aren’t seeing full blown capitulation from market timing newsletters. Business Week is one of my favorite magazine indicators because it has such a rich contrarian history. This week’s cover isn’t as pessimistic visually as the corresponding article. A more probable outcome is the one drawn from the narrow history of bear markets that grew out of financial crises. In it, the bear scenario continues to play out until the bull takes over, with more debt busts and government trial and error until things get set right again. That could mean two more years of bouncing around and then another six or so before the Dow is back above 14,000. Not long ago, such an outcome would have seemed unimaginably bleak. Given the other possibilities, it doesn’t seem so bad now. Source: When will the the bull return? You know what, I would like to know that “nostradamus” guy who predicted both market drop! Damn! He is good! Has he send you anymore email regrading when the next bounce? !